With Anzac Day swiftly following the Easter long weekend, many may accidentally overindulge during this ten-day holiday period. With chocolate eggs to hunt and the smell of freshly baked hot cross buns constant in the air, it can be hard to be healthy during a holiday focused on unhealthy foods. Luckily, macadamias offer a delicious and nutritious solution. As Australia's only native plant to be commercially grown, the macadamia acts as both the perfect gifting idea for your guests, and the perfect healthy treat. In other words, this nut is your answer to the ultimate guilt-free indulgence. The healthy fats, fibre and protein in nutritious macadamia nuts are proven to satisfy and aid you in resisting the urge to overeat. Macadamias are also full of phytochemicals, fibre, protein, vitamins and minerals, making them good for your heart, digestive health, antioxidant protection and blood glucose management. 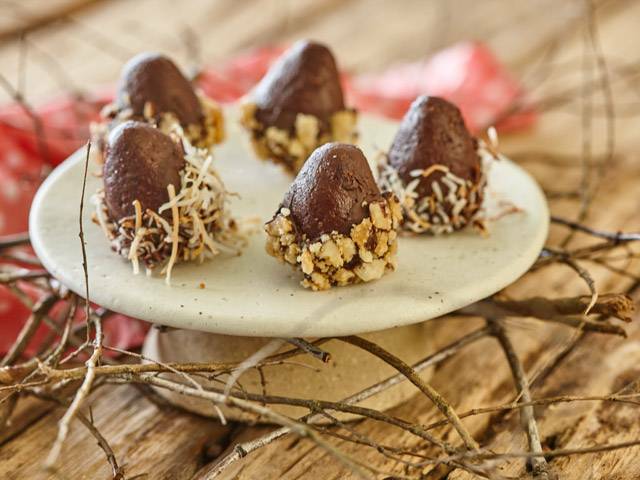 Clean-eating this Easter doesn't need to be boring, you'll agree when you try this recipe for raw macadamia bliss ball Easter eggs. A combination of Medjool dates, coconut, cranberries, cacao and of course creamy macadamias - all blended into delicious egg-shaped bliss balls! Warning: may conclude in eating the whole tray, yes, they're THAT good! Place the dates, 1 cup of macadamias, cranberries and cacao in the bowl of a food processor and process until the mixture is smooth and rolls together to form a ball. Roll heaped tablespoons of the mixture into individual balls shaped like eggs and refrigerate until cold. Preheat oven to 180°C. Place the ¼ cup of macadamias in a food processor and process until coarsely chopped. Spread on a baking tray and roast for 10 minutes, or until golden. Cool and place into a small bowl. Place the toasted coconut in another small bowl alongside the bowl of macadamias. Place the melted chocolate in a third small bowl. Dip the bottom of each bliss ball egg in chocolate and then either the macadamias or shredded coconut. Repeat with all the eggs. Refrigerate until ready to serve or deliver.